My sister, Mary Klaff, was with her husband, Harry, visiting their daughter in the Bay Area and Mary sent me a video of this green-backed bird with a red head. She wanted to know “What is that squawking bird in the tall trees around San Francisco?” With some research on the internet, reports abounded with stories of small parrots (parakeets) that had escaped their cages, and taken to the air. Urban legend is that the first surviving pair was freed from a bird lover’s cage. Over the years the birds have bred with each other and with other sub-species to create a hybrid, dubbed the Cherry-Headed Conure. 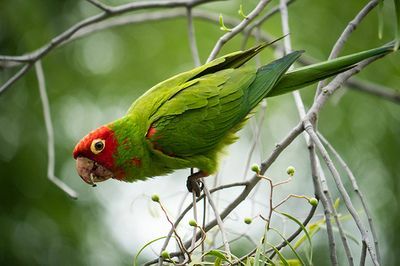 Sometimes called the red-masked parakeet (Psittacara erythrogenys), the cherry-headed conure is a medium-sized parrot from Ecuador and Peru. It is a popular pet around the world, primarily because of it’s “talking.” Many bird lovers consider it the best talker of the parrot and conure families. Red-masked parakeets coloring is remarkable. It has a bright green body, elegant green wings and a mostly red head. Also the bird has an elongated pale yellow eye-ring that is conspicuous and distinctive. When the conure is in flight you notice that it also has lesser and median underwing coverts that are red. Splotches of red on its neck and legs, it is a beautifully colored species. Many people say that they do not see the bird first, but they hear it. It’s call is a two syllabled squawk that is harsh and very loud. There are many feral species of these birds in Florida and California, as my sister discovered. Their wide distribution and popularity as pets contributes to their successful introduction in other areas. Once released in fair climates they seem to thrive as exotic feral birds, filling a niche that had not been invaded by falcons and other predators. The Cherry-Headed Conures are seen in San Francisco on Telegraph Hill and in Golden Gate Park, so keep your eyes and ears ready for them when you are in the city. I spotted some other feral parakeets in Rehoboth Beach, Delaware, many years ago, when my wife and I were engaged. They have thrived in that little beach town ever since. For most people, a trip to Rehoboth is not complete without a bucket of Thrasher’s French Fries, slathered with ketchup, while walking along the boardwalk promenade and gazing at the rolling ocean waves. According to the local news, there is a growing number of vacationers who go to see unusual birds in their stick nests, (mostly palm trees, telephone poles and pine trees) tending their young. These nests are found mostly on a small strip of land by an inland pond, magnanimously named Silver Lake. There the vacationers look and listen for a flock of feril parrots known as Monk Parakeets. 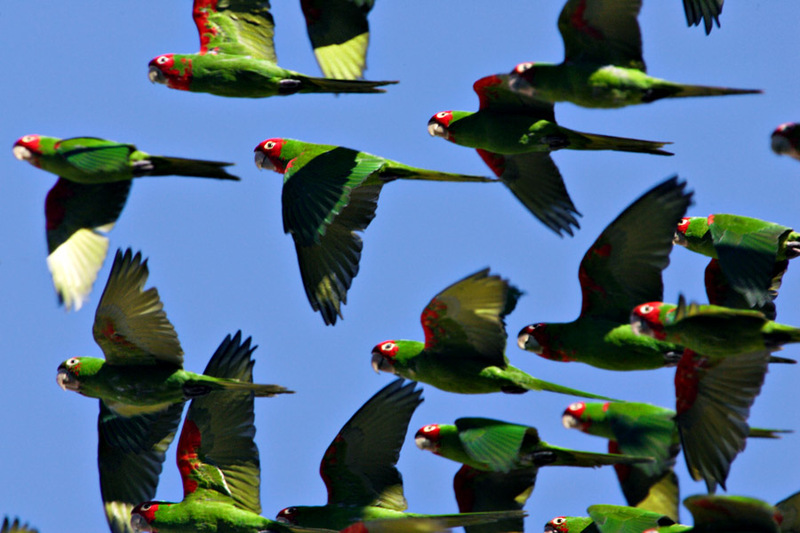 Though many theories have emerged over the decades, most birders believe that like the Red-Headed Conures in San Francisco, the Monk Parakeets were freed by a local who didn’t want their pets caged their entire lives. Regardless of their Delaware hybridization, the wild birds have thrived. Often regarded as pests in other areas, these birds have both graced and plagued the exclusive Silver Lake neighborhood with their noisy, colorful presence. The bird colony has made a home for their members in the hearts of both residents and visitors to this beach town. The appearance of the 11-inch birds is arresting — bright-green heads and backs, blue flying feathers, yellow belly bands and gray chests and foreheads. And their headache-inducing squawk is astonishing. Their communal nests match the attention-getting quotient of their looks and noise: huge balls of sticks with several round openings — kind of bird apartments, with water view. 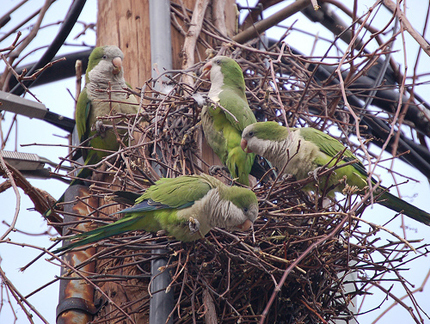 The monk parakeets are believed to be the only parrots to build nests exclusively of sticks. In Rehoboth they do most of their stick nest construction in pine trees near Silver Lake. The best places to observe the parakeets in action move around from year to year. Lately, however, according to locals, they have been regular inhabitants of the utility poles and trees on Lake Drive and St. Lawrence Street.